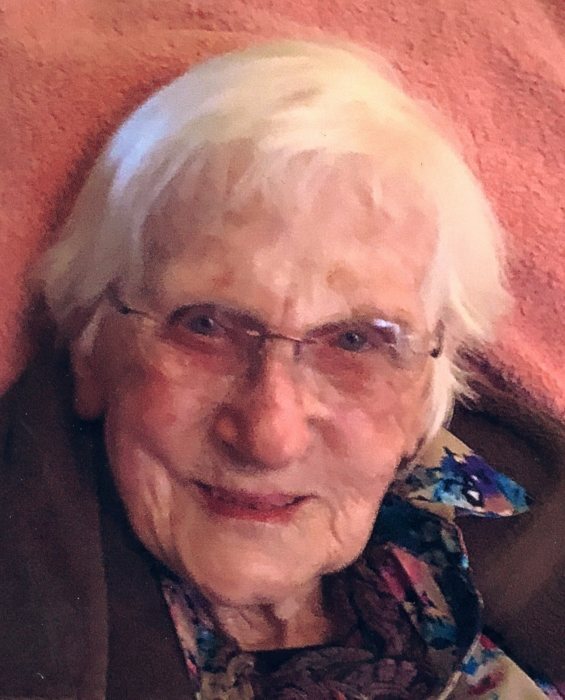 Anne W. Graff (Rodenkirch), age 102 years, of West Bend was called home to be with the Lord on April 12, 2019 at Ivy Manor surrounded by her loving family. Anne was born on April 21, 1916 in St. Michaels to Nicholas and Gertrude Rodenkirch (Schneider). She was united in marriage to Allen Graff in January 1940. Allen passed away in 1963. Anne graduated from St. Boniface High School in 1934. She started part-time at B.C. Ziegler in 1951 and continued working there and went full-time until she retired in 1981. Anne enjoyed rummage sales, bowling, helping out at church, taking care of her grandchildren, cheering for the Milwaukee Braves and Brewers as well as her occasional sip of Jagermeister. Those Anne leaves behind to cherish her memory include her four children, Lawrence Graff, Sandra (Edward) Staehler, Robert (Susan) Graff and Renee (Thomas) Harycki; her ten grandchildren, Christine McDonald, Gayle (Neal) Yoho, Shelly (Scott) Heneisen, Kimberly Staehler, Amy Staehler, Matthew (Theresa) Graff, Angela (Ryan) Blair, Brian (Laurie) Harycki, Michael (Laura) Harycki, and Mark (Emily) Harycki; her many, many great-grandchildren and great-great grandchildren. She is further survived by nieces, nephews, other relatives and friends. In addition to her parents, Anne was preceded in death by her husband, Allen; an her eight siblings, Thomas Rodenkirch, Cecelia Rodenkirch, Frank (Dorothy) Rodenkirch, Dorothy (Arthur) Schmidt, Marie (John / Val) Puechner-Jaworski, Alphonse Rodenkirch, Anthony (Virginia) Rodenkirch, and Barbara “Babs” (Phillip) Eder. Mass of Christian Burial for Anne will be held at 10:30 am on Wednesday, April 17, 2019 at St. Mary’s Immaculate Conception Parish (406 Jefferson St. – West Bend, WI 53090) with Father Andrew Infanger officiating. Interment at Holy Angels Cemetery in West Bend. Anne’s family will greet relatives and friends at Church on Wednesday from 9 am until the time of service. Anne’s family extends their heartfelt appreciation to the staff at Ivy Manor and Serenity Hospice for the loving care they provided. The Myrhum Patten Miller & Kietzer Funeral Home of West Bend has been entrusted with Anne’s arrangements. Additional information and guest book may be found at www.myrhum-patten.com.